Durable shrub 6' tall x 4' wide. Native over wide range SW, Calif. to Tx, Col to Mx. White rose flowers appear intermittently heavily Apr-May. Named for its feathery seed heads. 3-8000' in arroyos, gravelly slopes in upper desert 3500-8000' Semi- evergreen. Fast. Wheat colored branches lined with small olive green lobed lvs. Full sun afternoon shade best. Durable, low maintenance. Excellent ornamental. 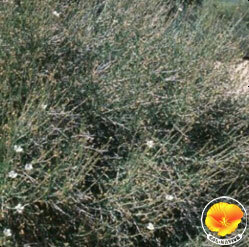 One of showiest of native shrubs. Drought & cold hardy. Erosion control. Wildlife cover.